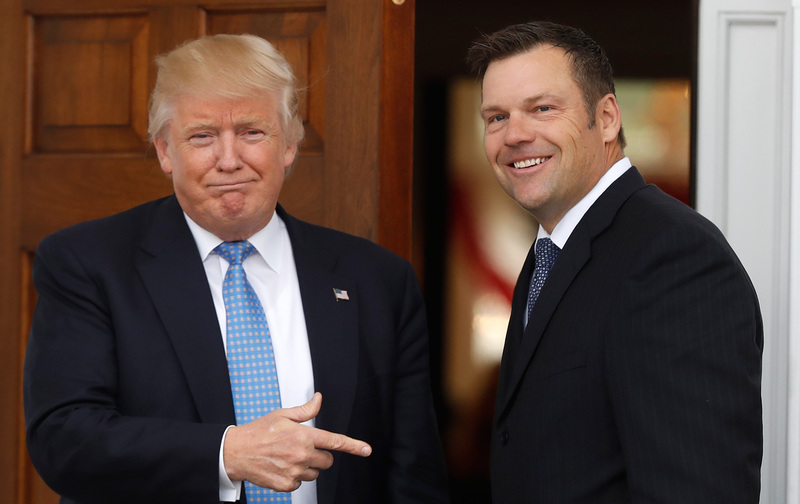 On June 28, Kansas Secretary of State Kris Kobach, the vice chair of Donald Trump’s presidential commission on “election integrity,” sent a letter to all 50 states requesting sweeping voter data, including Social Security numbers, party affiliation, criminal backgrounds, and military history. At first, only a few states, like California, Kentucky, and Virginia, said no, denouncing the commission as “a waste of taxpayer money and a distraction from the real threats to the integrity of our elections today.” But over the holiday weekend, opposition to Kobach’s request dramatically increased from both red and blue states. As of Thursday evening, 48 states have refused to turn over private voter data to Trump’s commission. “I’ve been studying America’s election administration since 2000, and I’ve rarely seen a firestorm like this,” wrote MIT political scientist Charles Stewart III. Twenty-one states are refusing to give Kobach any data and 27 states are handing over only limited public information on voters (a full list of the states appears below). Even Kobach couldn’t hand over Social Security numbers to himself because they’re not publicly available in Kansas. Two states have not yet responded. Also notable is the opposition from members of Trump’s own election commission, like Indiana Secretary of State Connie Lawson, who said, “Indiana law doesn’t permit the Secretary of State to provide the personal information requested by Secretary Kobach,” and Maine Secretary of State Matthew Dunlap, who told Kobach, “Upon review, the request is denied.” One member of the commission, Maryland Deputy Secretary of State Luis Borunda, has already resigned. The outpouring of bipartisan opposition shows why Trump’s sham election commission should be disbanded before it does any more damage. The commission was set up for one purpose—to spread false information about voter fraud, like Trump’s gigantic lie that millions of people voted illegally, in order to build support for policies that make it more difficult to vote. Kobach and his ilk have long advocated for suppressive policies like strict voter-ID laws, documentary proof of citizenship for voter registration and voter purges, along with weakening landmark voting-rights laws like the Voting Rights Act and National Voter Registration Act. Representative Marc Veasey, co-chair of the Congressional Voting Rights Caucus, has introduced legislation to ensure that no taxpayer funds are spent on Trump’s commission. “The commission’s mission to study non-existent voter fraud cases has nothing to do with ballot security and everything to do with voter suppression and discrimination,” he said. We need a commission to investigate the impact of Russian hacking and voter suppression on the 2016 election. We don’t need a disgraced commission on election integrity that only threatens the integrity of our elections. States that won’t comply with Kobach’s request: Arizona, California, Connecticut, Delaware, Illinois, Kentucky, Louisiana, Maine, Maryland, Massachusetts, Minnesota, Mississippi, New Mexico, New York, Pennsylvania, South Dakota, Tennessee, Vermont, Virginia, Wisconsin, Wyoming. States that will hand over only select public voter data: Alabama, Alaska, Arkansas, Colorado, Florida, Georgia, Idaho, Indiana, Iowa, Kansas, Michigan, Missouri, Montana, Nevada, New Hampshire, New Jersey, North Carolina, North Dakota, Ohio, Oklahoma, Oregon, Rhode Island, South Carolina, Texas, Utah, Washington, West Virginia. States that haven’t responded yet: Hawaii, Nebraska. Editor’s Note: This story is being updated to reflect new developments.